ToolBank USA, American Logistics Aid Network, Transportation Intermediaries Association, HaulFox and LINKEX Collaborated to Haul Hope to the People of Port Arthur. DALLAS, Sept. 7, 2018 /PRNewswire-PRWeb/ — A year ago, Hurricane Harvey pounded southeast Texas causing almost $130 billion in damage in Port Arthur, Texas. Today, the area continues the painstaking rebuilding process. The people of Port Arthur have spent the last 12 months living in FEMA trailers, staying with relatives or making due by living in severely damaged, moldy or flood-rotted homes in desperate need of critical repairs. In response to the devastating hurricane events in Texas and the surrounding area, the ToolBank Network has responded by working around-the-clock to provide support to the people of Texas. The Houston ToolBank chapter has loaned hundreds of thousands of dollars’ worth of tools to volunteers in the Houston area. Their ToolBank Disaster Services mobile unit is on the ground providing tools to help their partner organizations with the clean-up and recovery efforts. Last week, ToolBank USA needed to deploy one of their trailers with the tools desperately needed to help with rebuilding efforts in Port Arthur. 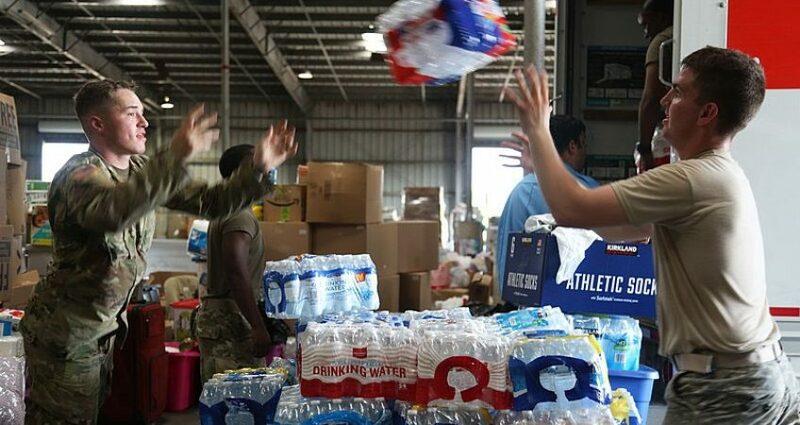 ToolBank USA reached out to the American Logistics Aid Network (ALAN), an industry-wide organization that exists to provide supply chain assistance to disaster relief organizations. ALAN, equipped with their logistics knowledge and connections, got to work right away to quickly find a transportation solution to help ToolBank USA and the survivors of Hurricane Harvey. ALAN sent out an “SOS” to their partner, the Alexandria, VA based Transportation Intermediaries Association (TIA), who, in turn, issued a call for help to their more than 1,700 transportation industry members detailing ToolBank USA’s urgent and specialized logistical need. “TIA members, like HaulFox, are amazingly generous within their communities and beyond. In fact, TIA recognizes a single company each year with the TIA Samaritan Award. We know that single company is a representative of the thousands and thousands acts of kindness that are performed by TIA members,” said Robert Voltmann, President and CEO, TIA. Within minutes of the TIA’s urgent call for help, HaulFox, a cloud based digital freight matching and logistics analytics software company located in Dallas, Texas, answered. HaulFox pledged their commitment to support the people that tragically lost their homes in Port Arthur by assisting ToolBank USA in their efforts. HaulFox reached out to their trusted clients, integration partners and other transportation contacts to facilitate the unique logistic solution needed to get the ToolBank Disaster Services mobile unit moved, safely and without delay. LINKEX, INC, a Dallas based logistics and transportation management company, joined in on the Port Arthur efforts by immediately locating the best Carrier with the right type of equipment within their Carrier network to transport the ToolBank Disaster Services mobile unit quickly and smoothly. Daily, HaulFox coordinates multi-source data feeds to identify strategic freight matching solutions to their clients. When presented with the challenge of coordinating a solution for a community continuing to live in devastation, the answer was routine. Third-party logistics companies (3PLs) powered by innovative logistics centric technologies have a vast resource network that allows them to execute logistics in an uber-efficient and cost-effective way. It is the continued collaborative efforts from socially aware organizations such as these that provides hope and the means to the resilient people of Port Arthur to finally rebuild their homes and restore their lives. Imagine the incredible impact the transportation industry has the potential to make, when selfless collaborations such as these take place. HaulFox is a business intelligent analytics solutions provider for the Transportation & Logistics Industry. The proprietary HaulFox software includes predictive digital freight matching, AI powered backhaul optimization, and synergistic pricing aggregation. All external and internal data is unified and amplified within the cloud-based HaulFox platform for a refreshingly fluid user experience. The HaulFox team is comprised of experienced 3PL practitioners, Senior Software Developers, BI Analysts, and Data Scientists who are passionate about enabling the industry to strategically leverage data intelligence using today’s technology solutions. A ToolBank® is a local nonprofit organization affiliated with ToolBank USA that stewards a vast inventory of actual tools for use by charities to advance their missions, increase impact, and reduce costs. Available tool inventory includes cordless drills, ladders, rakes and shovels, circular saws and paint trays, and MUCH more. Through quick and reliable access to large quantities of high-quality tools, each ToolBank transforms volunteerism in its area! ToolBank tools are not available for use by individuals; the ToolBank is a resource for the charitable sector. LinkEx, Inc., a Saia, Inc. company, is an asset-light, third party logistics company based in Dallas, Texas. Founded in 2002, the company offers a wide range of services including supply chain design, domestic and international transportation, warehousing and final mile services. LinkEx seeks to work closely with its customers to develop a thorough understanding of their logistics challenges and then utilizes technology and design capabilities to create unique supply chain solutions. For more information, visit http://www.linkex.us or call 972.481.9900.